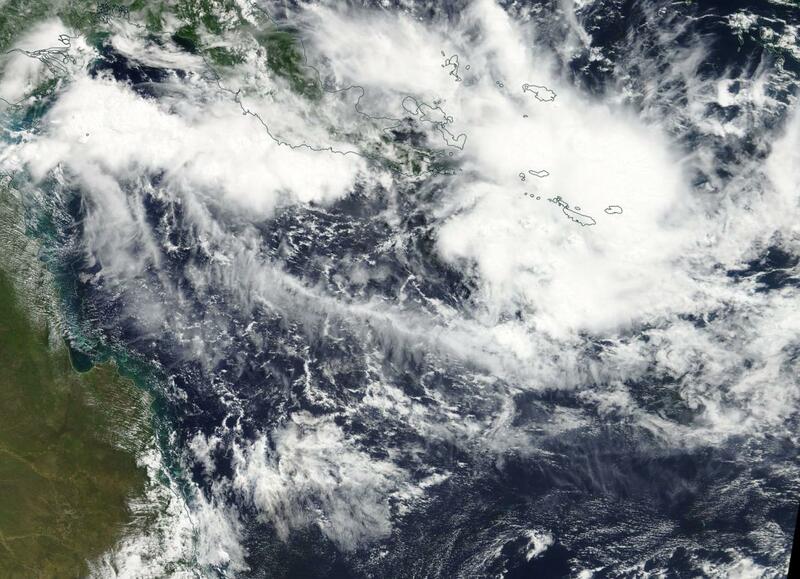 The remnant low pressure area that was once Tropical Cyclone Iris continues to linger in the South Pacific Ocean. NASA's Aqua satellite passed over the system and captured a visible image of it. The Joint Typhoon Warning Center or JTWC noted on April 12 at Iris' remnants were located near 11.9 degrees south latitude and 151.7 degrees east longitude. That's approximately 285 nautical miles (328 miles/528 km) north-northeast of Willis Island, Australia. Maximum sustained surface winds are estimated at 20 to 25 knots (23 to 28.7 mph/37 to 46.3 kph). Minimum sea level pressure is estimated to be near 1003 millibars. The Moderate Resolution Imaging Spectroradiometer or MODIS instrument that flies aboard NASA's Aqua satellite captured a visible image of the remnants on April 12. The image showed that the system was ill-defined and appeared elongated. Clouds and thunderstorms associated with the low pressure area appeared somewhat scattered. JTWC noted that "Global [computer forecast] models are in agreement that the disturbance will remain weak, but the possibility remains that the system could develop into a weak tropical cyclone after 84 hours [April 16]. The potential for the development of a significant tropical cyclone within the next 24 hours remains low."